Pure ingredients like garcinia cambogia / raspberry ketones / green tea / green coffee bean extract combine to burn belly fat & increase metabolism in men and women. Do not exceed recommended dose. Not intended for children or pregnant/nursing mothers. Individuals taking medication or have known medical conditions should consult a doctor before using. Discontinue use if adverse reactions occur. Not intended to diagnose, treat, cure, or prevent any disease. KEEP OUT OF REACH OF CHILDREN. DO NOT USE IF SAFETY SEAL IS DAMAGED OR MISSING. KEEP BOTTLE CLOSED TIGHTLY AND STORE IN A COOL, DRY PLACE. Improved amount of catechins in the green tea extract – 130 mg at 75% – higher level of purity than other weight loss supplements – green tea can increase metabolism by 4% over a 24 hour period. Garcinia cambogia includes pure HCA which is an excellent fat burner and appetite suppressant – can also keep blood sugar levels and cholesterol under control as well as making it easier to eat less. Raspberry ketones can be used to support natural weight loss – increases metabolic rate & increase energy levels – pure green coffee bean extract contains Chlorogenic Acid for weight loss. Use these weight loss pills to achieve the results you want without having to spend hours in the gym each day. Garcinia cambogia, green tea, raspberry ketone, and green coffee bean extract combine to give these pills from Bio Sense extra potency. 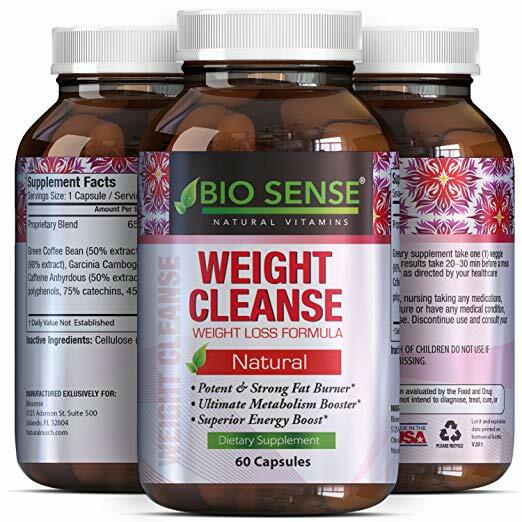 These weight loss supplements for women and men are all natural, and contain no magnesium stearate, no silicon dioxide, no filler – even the capsules are made from cellulose instead of a chemical compound. The ingredients combine to promote a variety of effects, such as increased metabolism, reduced appetite, the control of blood sugar levels and cholesterol. A material called HCA that exists in garcinia cambogia will keep those blood sugar levels and cholesterol in check, while Chlorogenic Acid in the green coffee bean extract can help to boost fat loss. Raspberry ketones have a number of benefits, but the main ones are to boost metabolism – which gives you a massive advantage when looking to burn belly fat and lose weight quickly. Contained within each capsule is 130 mg of green coffee bean extract, 130 mg raspberry ketones, 130 mg garcinia cambogia and 130 mg green key – with 75% catechins. Take 1-2 capsules around 30 minutes before food, make sure to take it with eight ounces of water and use these weight loss pills with a sensible diet and exercise program.